Being a novice in the world of woodworking, I asked myself what criteria would be necessary to properly critique this product I received from the people of Rockler. Since there really isn't much to a piece of machine aluminum with predrilled holes and a couple of inserts, I had to base my evaluation upon its design and features. 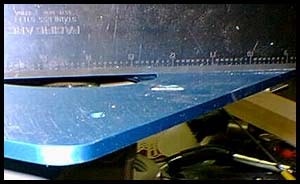 Most router plates I have seen in catalogs and magazines are made up of primarily 3/8" phenolic, acrylic, or polycarbonate. 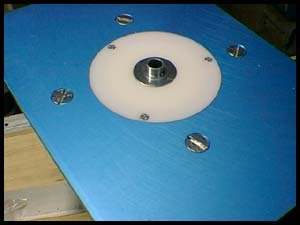 The Rockler plate is made of 1/4 machined aluminum and anodized in a sky blue color. It measured 7 15/16" x 11". Rockler offers predrilled mounting for Porter Cable models 7529/690/693/7518/7539. Dewalt Plunge 2HP router, and Bosch models 1617 and 1618.I ordered the plate for my Porter Cable 7518. 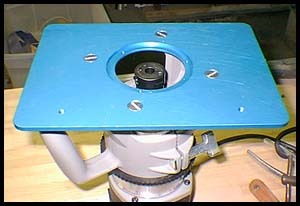 This saves me a lot of time trying to center my router onto the plate. The fit was perfect. I used a straightedge and checked for flatness. The result was a true flat piece of metal. inserts installed, it measured 3 1/2". 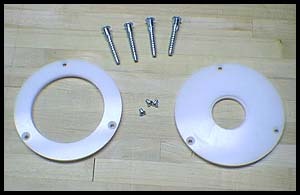 The inserts are attached using 3 machine screws. I thought this was a nice feature because I have used a router plate where the inserts snapped in and found it very difficult to pry open and snap in the rings. If you do a lot of template routing, the 1 1/4" insert accepts guide bushings.The one thing this plate should have come with was a starting pin. I called Rockler and spoke to Steve Krohmer, who sent me the plate, and he said a newer version of the plate is coming out and will include the starting pin. 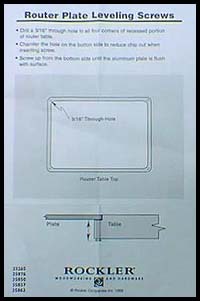 The only instructions that came with the unit was a piece of paper explaining where to drill for the leveling screws (pic 6). I had to come up with a template in order to mount the plate properly. However, speaking to Steve again he said a template would be available in the fall. The leveling screws are a nice feature, however, I would have preferred each corner of the plate be drilled and tapped for a set screw. I think it would be easier to level the plate. Overall, I think the people at Rockler have developed a very fine product. I was very pleased with it and wouldn't hesitate recommending it to others. I would wait for the newer version with the starting pin and get the template for it when available. For more information about Rockler's router table insert, you can access their webpage by clicking here.